Sofian Khan: A drive has been launched yesterday by Mayor Sayeed Khokon to eradicate larvae of Aedes mosquito from Dhaka South City Corporation (DSCC) areas. According to the Mayor, the drive will be conducted at every household of 5057 holdings under DSCC for the next two weeks. 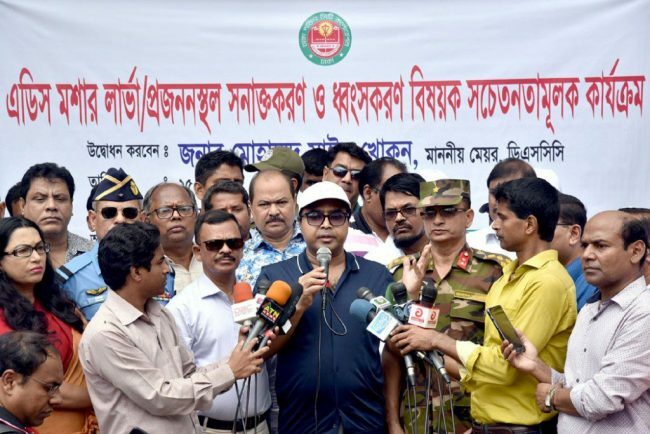 “The team will also give training to the people of the residents on how to destroy Aedes larvae where those are found,” Sayeed Khokon also said. A report will be made based on the two-week drive and further action will be taken based on it, our correspondent reports quoting the mayor. Legal actions will be taken against the people of the household where larvae would still be found after the DSCC teams’ training, the mayor added.